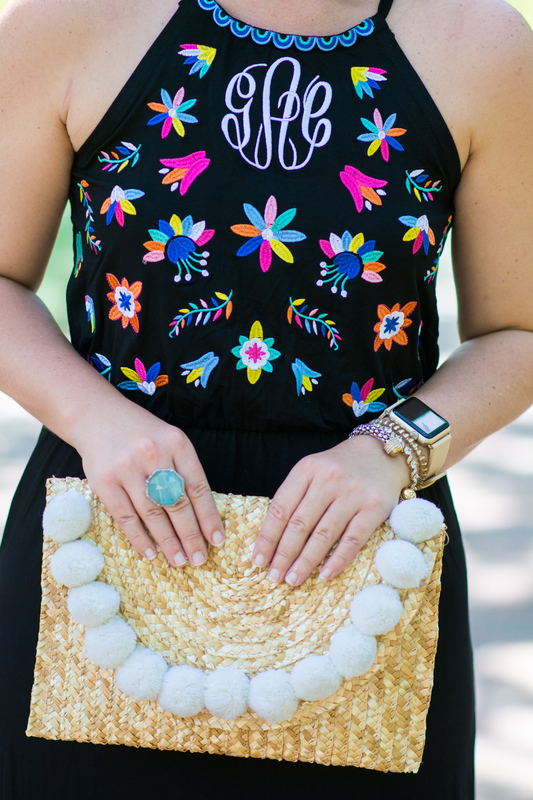 Bring on the chips & the guac… I’ve got a dress that’s ready for a FIESTA! Y’all know my love for a fiesta, and you definitely know my love for a monogram, so then combine the two and you have the most perfect dress ever! I always get so excited when I see a Marley Lilly package waiting for me at the door because opening it up is like opening up a box of happiness! Every single piece I’ve ever gotten from them has always been exceptionally made (this dress for example is the softest, bounciest cotton and feels like a dream in the summer heat!) and always has the best details! I’m swooning over the little rainbows that line the bottom of this dress! I normally hem my maxi dresses so that I can wear flats, but I couldn’t bear to lose the trim on this dress- so tall wedges it is!! ha. While we all know that black isn’t normally my color, when you add this bright embroidery on top- all of a sudden I cannot get enough! Ole!! Just had to tell y’all how excited I am about the next batch of photos coming to the blog! My sweet Aunt (who takes 90% of my pictures) and I have both been traveling so much that we haven’t been able to meet for pics. I was totally out of styled looks until I realized that my girlfriend Nina from college is now a professional photographer and we got together Sunday to shoot a few looks and had the BEST time! So thankful for how the Lord works to bring friends (back) together. If you’re local be sure to check her out– she is such a doll! You look absolutely amazing in this dress! I love the monogram, so you and so cute! This dress is so cool! I love the bright embroidery and the monogram is just fabulous. You look beautiful in black! I love that the monogram is subtle and part of the embroidered detail!